Are you all excited? Well, you should be, because Soda PDF is coming in strong with another new release! Some of you may have seen our sneak peeks prior to the release, but now it’s time to reveal everything. Soda PDF 11 is the newest update to your favorite PDF software. It comes loaded with new features, improvements and bug fixes, all directed towards giving you the best user experience possible! We are most excited to announce that our Forms received a major upgrade! Read our post on our new Dynamic Forms here & check out the full specs and release notes below. 1. Formatting for text fields and combo boxes provides several new formatting capabilities, including: decimal place & separator style for numbers and percentages, currency symbols, date, time, zip code, phone number & social security numbers. 2. Validation for text fields and combo boxes provides the ability to identify a range of acceptable answers for both numbers and percentages. 3. Calculation for text fields and combo boxes enables calculation between text or combo fields using sum, product, average, min/max values of other fields or use of a custom script. 4. On Change options for list and combo boxes provides the ability to perform an action based on a change in a list or combo box. 5. On Sign options for digital signature provides the ability to modify other fields once you add a digital signature to the document. 6. Date selector with calendar enables the selection of a date from a form field that is then displayed. 8. Spellcheck functionality was added to form fields. 9. Editable field dimensions allows for finer control of form field height and width as well as X & Y positions. 10. Additional actions for fields such as: Submit Form, Reset Form, Show Field & Hide Field. 1. Draw Cloud was added to the Review tab, providing the ability to customize a cloud’s shape and size by setting its perimeter. 2. Rotate option was added to all Shapes and can be accessed by a rollover on the shape’s bounding box. 4. The Bookmark panel can now add a functional Bookmark without having to use Add Actions. You can update Bookmark destinations via right-clicking a bookmark and choosing ‘Set current as destination’. 6. The Comment panel now has only one level of replies. When a reply is made, the author is identified by @UserName, which appears at the top of the reply. 7. CTRL & SHIFT buttons for Stamp, Shape and Signature field are now functional when inserting the shape for the first time (you could previously constrain the proportions only once the shape was inserted). 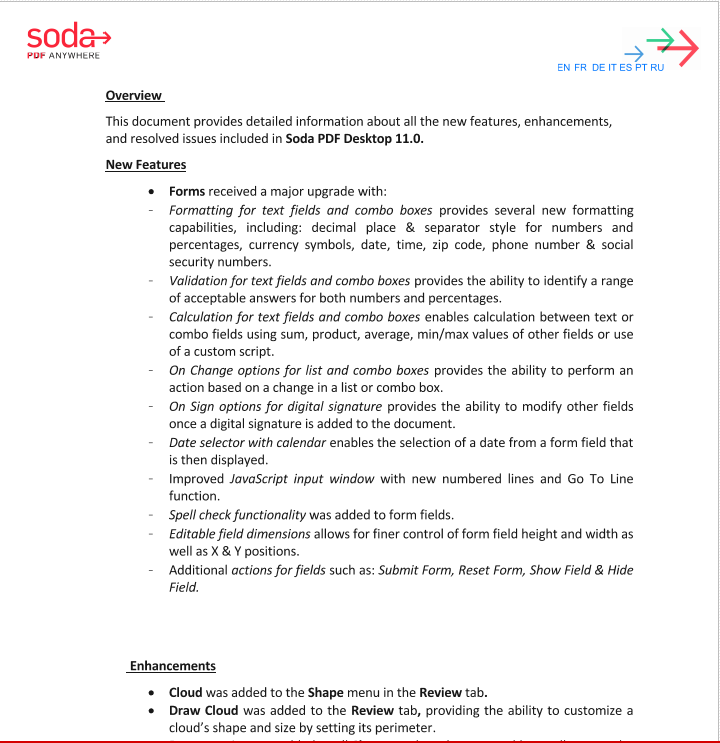 Click the image below to access the complete Soda PDF 11 release notes. This includes a full list of changes made, including more features, improvements, and bug fixes. The release notes are available in English, French, German, Italian, Spanish, Portuguese and Russian.